Hi! I’m Samantha Bandstra, a social work student at Chicago Semester. After just a few weeks living in the Windy City, I have fallen in love with the city and its people. I assumed that people in Chicago would be too busy to talk, but I was happily surprised when many of the people I met were friendly and helpful. I have seen a stranger run to give a girl her dropped bus pass, and a whole train car of strangers ooh and aah over a couple’s new baby. Additionally, my internship at the Institute of Therapy Through the Arts has shown me how art and relationships can heal people, and how much beauty there is in people with physical, mental, and emotional problems. 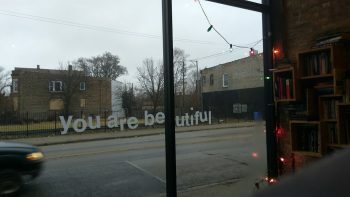 And although I have seen beauty and friendliness in Chicago, I have also seen brokenness and pain. Neighborhoods still segregated, some neglected by their lack of income. I have seen drunken people looking for a ray of hope, always chasing it, but never finding that hope. I have met many people who are just trying to get through the day, get through the week, and get through life. Even though I have felt welcomed by people here, I have also felt the pain of loneliness while being surrounded by thousands of people. Finding brokenness and beauty in Chicago is what my classes and friends at the Chicago Semester have taught me. I am thankful for my Urban Planning Class that teaches me about the history of Chicago and the reasons why Chicago’s neighborhoods are designed the way they are. I am thankful for my Social Work S eminar and my knowledgeable field instructor that equip me to be a Social Worker in the city. And I am thankful for my friends I have made through the Chicago Semester that go on adventures with me. 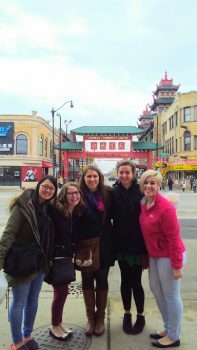 We have busied ourselves in finding all of the free things to do in Chicago (which is quite a few museums and art galleries, actually), and finding the cheap grocery stores so we can splurge at ethnic restaurants on the weekends. We will not run out of things to do in Chicago, that’s for sure! All in all, I am thankful for what I have learned so far through the people here in Chicago, and I am excited for what adventures lie ahead! If you are thinking about trying out Chicago, take a leap outside your comfort zone – you’ll grow in your faith, courage, and confidence.